This ground lease allows the tenant to construct a hotel on a parcel owned by the lessor. The tenant is responsible for all taxes, utilities and construction costs. The rent is specified for the first five years of the term and is adjusted by the CPI thereafter. The tenant has unlimited rights to sublease portions of the premises, and broad assignment rights. The "Premises" consist of approximately ______ acres of real property located on _______ in _______, _______ County, as more fully described on Exhibit A attached hereto, together with any buildings and other improvements hereafter constructed thereon (such buildings and other improvements hereafter constructed are hereinafter called the "Improvements"); any and all interests of Landlord in streets adjacent thereto; and any and all other rights and interests of Landlord appurtenant to said parcel and streets. "Ground Leasehold Estate" shall mean all of Tenant's rights and interests under this Ground Lease. "County Recorder" shall mean the land records office or offices in which the deed of the Premises is recorded, as identified on Exhibit A.
Landlord represents and warrants that Landlord has good and clear record and marketable title to the Premises, subject only to encumbrances identified on Exhibit A. Landlord covenants and agrees not to grant or permit or suffer to attach to the Premises any easement, restriction, lien or other encumbrance affecting the title to the Premises during the Term of this Ground Lease other than restrictions and other encumbrances in the name of Landlord requested by Tenant. Landlord shall have thirty (30) days to bond off or otherwise discharge any encumbrance suffered in violation of the preceding sentence. (d) No portion of the Premises has ever been used for the manufacture or storage of hazardous waste, as defined by applicable state local or federal law. The "Original Term" shall be a period of thirty (30) years, commencing upon the first day of the month following execution of this Ground Lease. The term "Ground Lease Year" as used in this Ground Lease shall mean each of the consecutive twelve-month periods of the Original Term or of any Extension Term of this Ground Lease. Tenant shall have the absolute and unconditional option to extend the Term of this Ground Lease for one or more of three (3) successive ten (10) year Extension Terms, each on all of the terms and conditions set forth in this Ground Lease. Each such extension option shall be exercisable by written notice from Tenant to Landlord given at least six (6) months before the commencement of each such Extension Term. During the Term of this Ground Lease, Tenant shall pay rent to Landlord at the address from time to time specified by Landlord herein, absolutely net without assertion of any counterclaim, setoff, deduction or defense and, except as otherwise expressly provided herein, without abatement, diminution or reduction, in advance in monthly installments on the first day of each month during the Term, in an amount equal to one-twelfth of the Annual Rent specified in this Section. The Annual Rent with respect to the first five (5) Ground Lease Years of the Original Term shall be $_________, commencing on _________ or upon the date that the Improvements on the Premises are opened to the public for business, whichever date occurs first. Upon every fifth (5th) anniversary of the commencement date of the Original Term, the Annual Rent shall be adjusted to equal (i) the product of (A) $___________, multiplied by (B) a fraction, the numerator of which is the CPI, as defined below, for the last full calendar month preceding such anniversary date (the "Extension Index"), and the denominator of which is the CPI, as defined below, for the last full calendar month preceding the commencement date of the Original Term (the "Beginning Index"), but not to exceed an increase of fifteen percent (15%), and in no event shall the Annual Rent be less than the rental in effect immediately prior to such adjustment. The "CPI" shall mean the Consumer Price Index for the Metropolitan ___________ area. All items, 1982-84=100, as published by the U.S. Department of Labor, or, if such index is no longer published, the most nearly similar index which is published by the U.S. Department of Labor. In the event the Premises is a portion of a larger tax parcel, Landlord agrees to use its best efforts to have the Premises designated as a separate parcel for taxing purposes so that the assessed valuation of the land and buildings shall relate only to the land constituting the Premises and to the buildings and improvements constructed on the Premises. A. In the event the taxes are identified or apportioned by the taxing authorities or are identifiable or apportionable based on valuation or other information furnished by the taxing authority so that the portion of the taxes attributable to the value of the land can be distinguished from the portion of the taxes attributable to the value of the buildings, then as to that portion of the taxes attributable to the value of the land. Tenant will pay a percentage of such portion of the taxes determined by dividing the area of the Premises by the total area of the assessed parcel, and as to the portion of the taxes attributable to the value of the buildings, Tenant will pay a percentage of such portion of the taxes determined by dividing the gross floor area of the building on the Premises by the gross floor area of all buildings located on the assessed parcel. B. In the event the taxes are not identified or apportioned by the taxing authority and are not identifiable or apportionable based on valuation or other information furnished by the taxing authority so that the portion of the taxes attributable to the value of the land cannot be distinguished from the portion of the taxes attributable to the value of the buildings, then as to all taxes, Tenant will pay a percentage of the taxes determined by dividing the area of the Premises by the total area of the assessed parcel. Landlord will notify Tenant in writing of any taxes which Tenant is required to pay in accordance with the provisions of this Section. Such notification shall be furnished to Tenant not less than twenty (20) days before the date such taxes are due and shall be accompanied by a copy of the tax bill. Any taxes which Tenant is required to pay shall be paid by it no later than the date on which such taxes are due unless the notification by Landlord is received by Tenant less than twenty (20) days before the date on which such taxes are due, in which event Tenant shall pay such taxes within twenty (20) days after the date of such notification, and Landlord shall be responsible for the payment of any penalties, interest or other charges imposed upon delinquent payment of taxes. In the event the Premises is a portion of a larger tax parcel, then the written notification by Landlord to Tenant of such taxes shall set forth (1) the total taxes on the larger tax parcel accompanied by a copy of the tax bill; (2) whether the total taxes on the larger tax parcel are identifiable or apportionable between land and buildings and if so, the amount of taxes, attributable to the land and the amount of taxes attributable to buildings; and (3) Tenant's portion of the total taxes together with a statement showing how Tenant's portion was calculated in accordance with this Section. If Tenant fails to pay any taxes which it is required to pay within the time period provided above, Landlord may, at its option, pay said taxes, together with any and all penalties and said amount shall become immediately due and payable as additional rent. Tenant shall have the right in its own name, or in Landlord's name where appropriate, but at its own cost and expense, to contest the amount or legality of any taxes which it is obligated to pay hereunder and make application for the reduction thereof, or any assessment upon which the same may be based, and the Landlord agrees, at the request of Tenant, to execute or join in the execution of any instruments or documents necessary in connection with such contest or application. If Tenant shall contest such tax assessment, or other imposition, the time within which Tenant shall be required to pay the same shall be extended until such contest or application shall have been finally determined, except that Tenant shall be responsible for any penalty imposed by the taxing authority resulting from the late payment of taxes due to said contest. In no event shall Tenant be liable for payment of any income, estate or inheritance taxes imposed upon Landlord or the estate of Landlord. Tenant shall not pay any income, franchise, excise, sales or excess profits tax levied upon, required to be collected by, or assessed against Landlord. Mortgagees after notice, as set forth in Paragraph 10. If applicable law or statute permits the payment of any or all of the above items to be made in installments (whether or not interest accrues on the unpaid balance), Tenant may, at Tenant's election, utilize the permitted installment method, but shall pay each installment with any interest before delinquency or the commencement of tax title proceedings. Landlord shall pay and discharge all real estate taxes and other sums due in respect of, or which might become a lien upon, the land of which the Premises are a part except to the extent the same is the responsibility of Tenant under this Ground Lease. All payments of taxes or assessments or both, except permitted installment payments for betterments and assessments, shall be prorated for the initial partial tax year included within the Term and for the partial tax year in which the Term expires. For such permitted installment payments, Tenant shall pay only the installment(s) falling due during the Term of this Ground Lease. Landlord appoints Tenant as Landlord's attorney-in-fact for the purpose of making all payments to any taxing authorities and for the purpose of contesting any taxes, assessments, or charges, all as hereinabove set forth. If either party shall fail to make any payment of taxes, assessments or charges as and when the same is required to be paid by it hereunder and either (i) such failure shall continue for ten (10) days after receipt by it of notice from the other of such failure or (ii) the other shall in good faith determine that immediate payment is necessary to prevent jeopardy to the other's interest in the land constituting part of the Premises and shall simultaneously give notice to the party required to make such payment to such effect, the other may cure such failure by making such payment, together with any interest and penalty thereon, the amount of which payment, plus interest thereon at a rate two percent (2%) above the so-called "Prime Rate", "Base Rate" or "Corporate Rate" of any successor rate quoted from time to time in the Wall Street Journal (the "Involuntary Interest Rate"), shall be paid by the party required to make such payment upon demand. Tenant currently intends to use and permit the use of the Premises for the construction, maintenance, and operation of a hotel and accessory uses, but Tenant is not obligated to construct a hotel or any other Improvements on the Premises. If, at any time prior to the commencement of construction of Improvements on the Premises, Tenant determines that Tenant will probably not be able to secure approvals for and construct a hotel of at least __________ rooms. Tenant shall promptly give notice to Landlord of such fact. In such event, Landlord shall have the option to terminate this Ground Lease by written notice to Tenant given within thirty (30) days after such notice from Tenant, in which event the Ground Lease shall terminate on the date when Landlord gives such notice, rent and other amounts paid in advance shall be prorated, and neither party shall have any other obligation to the other. In the event Tenant gives such a notice but Landlord does not elect to terminate the Ground Lease Tenant shall thereafter have the absolute right at any time to use the Premises, or permit them to be used, or any lawful purpose except for adult movies/bookstores or an abortion clinic. 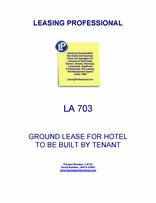 In the event that Tenant constructs a hotel on the Premises, the Premises shall be used for hotel and accessory uses only during the first 10 Ground Lease years, and Tenant shall thereafter have the absolute right at any time to use the Premises, or permit them to be used, for any lawful purpose except for adult movies/bookstores or an abortion clinic. Tenant may obtain zoning changes and conditional use permits and may enter into agreements restricting use or granting easements in or over the Premises, provided that no such agreements shall be binding upon Landlord or the Premises after the expiration or termination of the Term of this Ground Lease without Landlord's prior written consent. Landlord shall, at Tenant's request and expense, join with Tenant in applications and proceedings to obtain easements, use and zoning changes at Tenant's expense.